There is no better time to experience the magic of Eureka Springs than Christmas. 365 days a year, Eureka Springs is a quaint Victorian village. For the month of December and beyond, Eureka Springs becomes a magical winter wonderland. 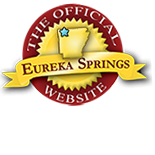 If you are looking for a great spot to get away this holiday season, book your Eureka Springs Holiday Getaway today. Celebrating Christmastime at the 1881 Crescent hotel has become one of the regions most famous holiday traditions. This historic hotel is home to events all month long. From their enchanting Christmas Forrest to the annual Santa’s Brunch. This is guaranteed fun for the whole family! Eureka Springs is known for its small, intimate shops and galleries. Forget Black Friday and shop Small Saturday! The charming stores in Eureka Springs have everything to offer when it comes to holiday shopping. If you are just into window browsing, the windows will come alive on December 10th! The annual tradition of living windows returns to Eureka Springs! A walking tour of a sampling of Eureka’s most beautifully restored homes giving guests a glimpse of a bygone Victorian era. If All stops on the self-guided tour will be lavishly decorated for the season with Victorian attired docents to relate the history of each home. Visitors will be treated to carolers, Christmas music and refreshments along their journey into the past. Visit eurekaspringspreservationsociety.org for more information and to purchase tickets. A year-round tradition in Eureka Springs takes on another meaning during the holidays. On Monday through Saturday nights the last weekend of November through January 1 with a by donation Drive-through light display with lights on from dark through 8:30pm. Let’s celebrate the Light of the World! Be moved by Music! Nothing evokes the holiday spirit like Christmas Music. Don’t miss John Two Hawks Holiday Concert, this year featuring Finnish singing star Johanna Kurkela, on December 5th at the Aud. This is a Eureka Springs favorite and soon will be one of yours! Also, check out Christmas at the Crescent’s Holiday Music schedule. There is something for everyone! The holiday season will be over before you know it. Don’t let it pass you buy. Book your holiday trip to Eureka Springs today. Click here for great Eureka Springs Lodging choices and for a full calendar of events for the Eureka Springs Christmas Festival, Click here! This entry was posted on November 23, 2016 by service424 in Attractions, Crescent Hotel, Family Fun, Festivals, Fun Downtown, History, Lodging Specials, Shopping, Things to Do, Weekday Getaway and tagged celebrate, christmas, Crescent, december, Eureka Springs, holiday, santa.